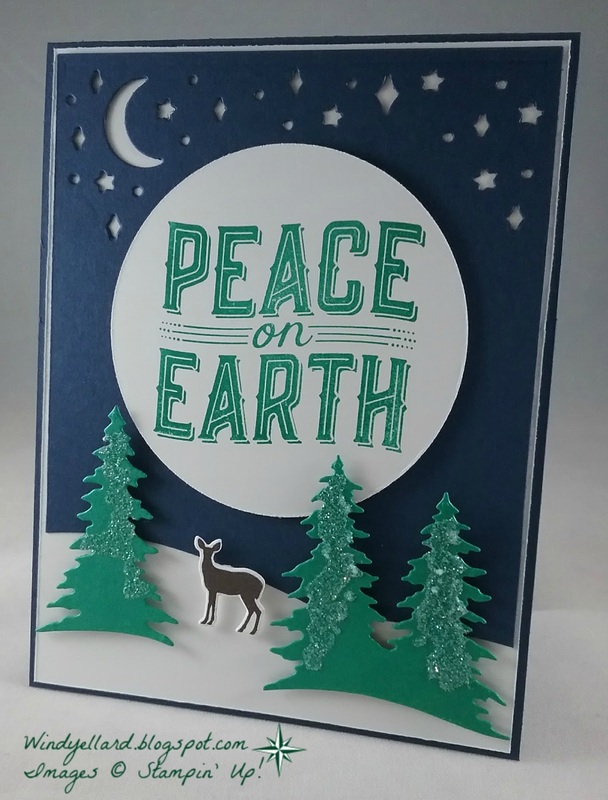 with Open, Circle, Glitter Paper. I used two shades of blue for a color challenge also. Night of Navy circle behind. and then a silver glitter paper star on top. 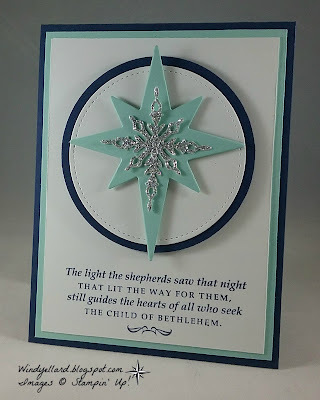 I love the sentiment from Star of Light set that I stamped in Navy. it all together, I liked the clean look. looking die is from the Swirly Scribbles thinlits dies. I used a sweet sentiment and pine cones from the Christmas Pines set. 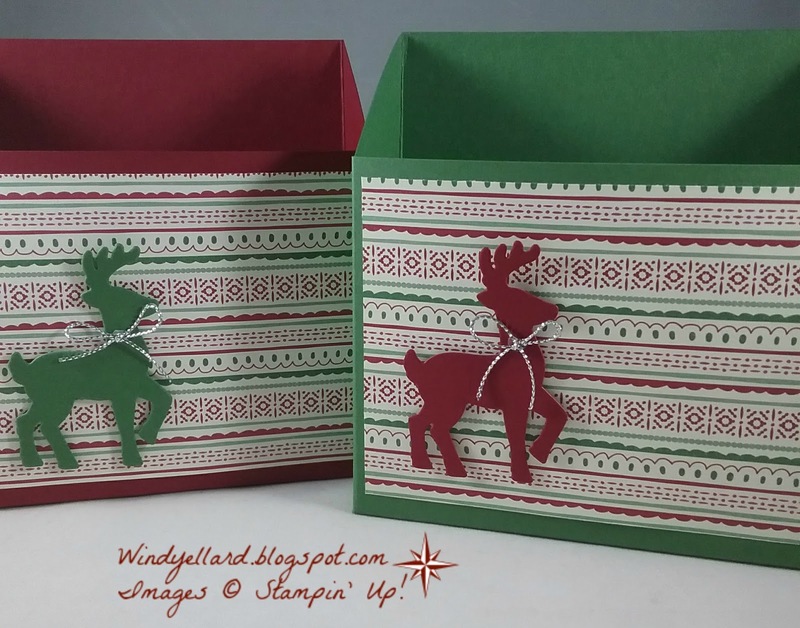 to carry their cards home from my Christmas card classes this week. Garden Green and Cherry Cobbler were mixed for these. with some silver cording tied in a bow. 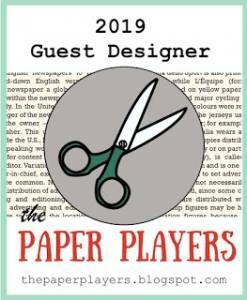 Start with a piece of 8 1/4"x 11" piece of card stock. Score on the long side at 5 1/4" and 7"
Score on short side at 1 3/4" and 6 1/2"
cut in for the flaps and assemble..so easy. You can make larger ones too to hold large dies. 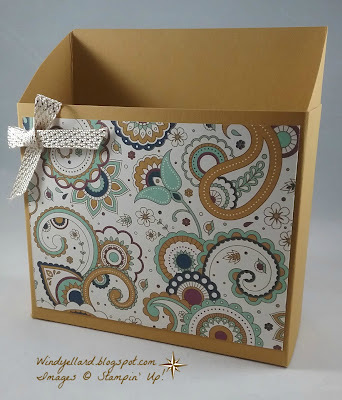 or they can hold regular size emboss folders. is a silver foil star up there. because they were laying on my desk from another project last week. Silver foil star on the circle. Whisper White in Night of Navy ink. I finished it off with a few silver sequin pieces. 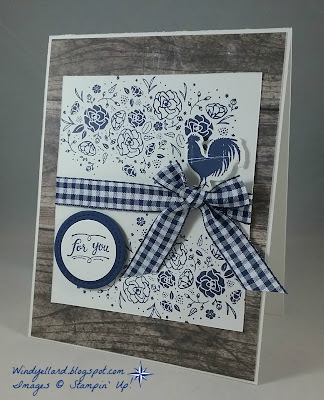 I like the layout and always love navy and silver together. Christmas Around the World DSP, you are missing out! It has some great plaid, nutcrackers and then this fun foodie/treats print. I decided to pair it with the Merry Cafe set hot chocolate cup. I stamped the cup in Soft Suede on same color card stock. I stamped the lid on white in Garden Green. 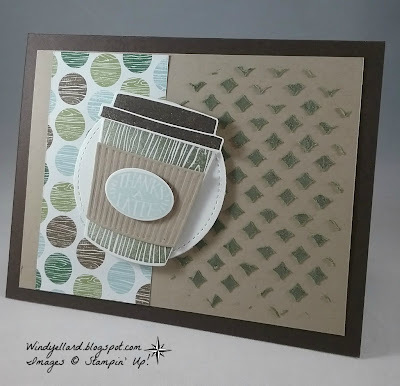 I cut all with matching dies from Coffee Cups framelits dies. then stamped in Real Red the two sentiments. I layered all together on Real Red then Whisper White and a Real Red base. with some retired Garden Green thread. Go play along and thanks for stopping by! This week we have a photo for inspiration. one direction and then turned and ran again. Yes, you can run it more than once for a full effect. 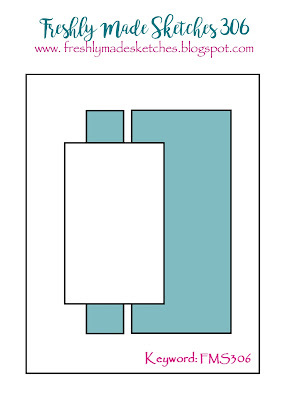 using the Layering Squares framelits dies. so they were a perfect addition. 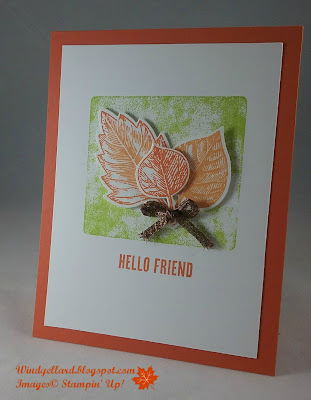 from Colorful Seasons in copper emboss powder. Playing the top row across for Metallic , Glow, Autumn Colors. leaf-both cut from the Seasonal Layers thinlits dies. Pie and rocked it in Cajun Craze before laying the copper one on top. I ran some clear wink of stella over it for some shine, too. I think it is glowing a bit! 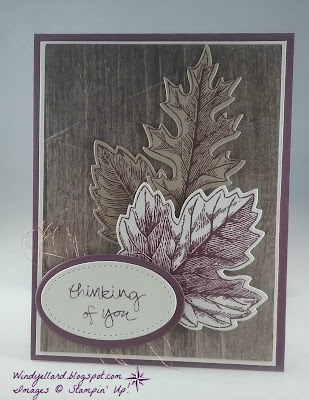 I stamped the sentiment in Fresh Fig on the stitched shapes. layered on a piece of Crushed Curry before placing on the Fresh Fig base. I finished it off with some copper trim and a bow I had already laying on my desk. 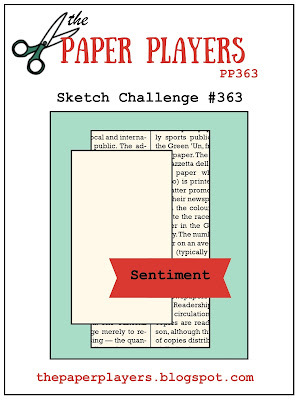 put them to good use for the sketch challenge. 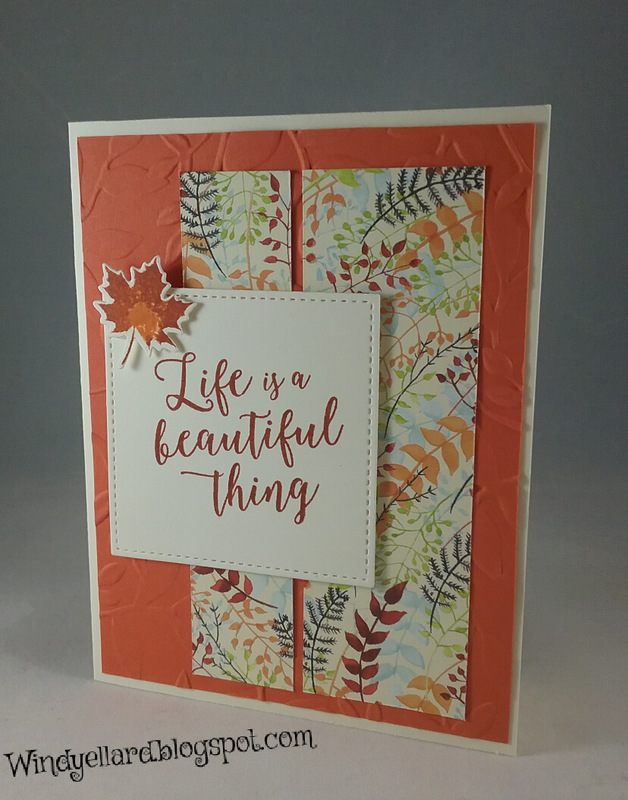 embossed with the Layered Leaves 3D emboss folder. don't you love the color mix in that paper? 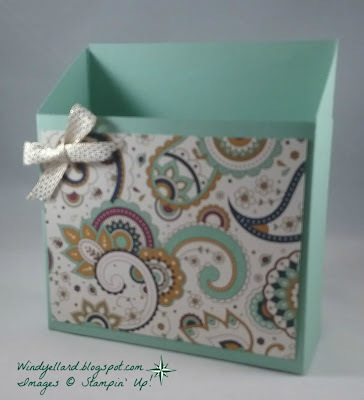 I stamped on a Very Vanilla stitched square in Cajun Craze. the leaf in Cajun Craze. Love the effect. Quick card but full of colors! I wanted to go simple for this color challenge. block inked in Lemon Lime Twist right onto the paper. in Peekaboo Peach and rocked in Tangerine Tango. in Tango. I "tied" them together by placing a piece of copper trim for a bow. I stamped the sentiment from Wood Words in Tango underneath. This was layered onto a Tangerine Tango base making for a clean and simple card. 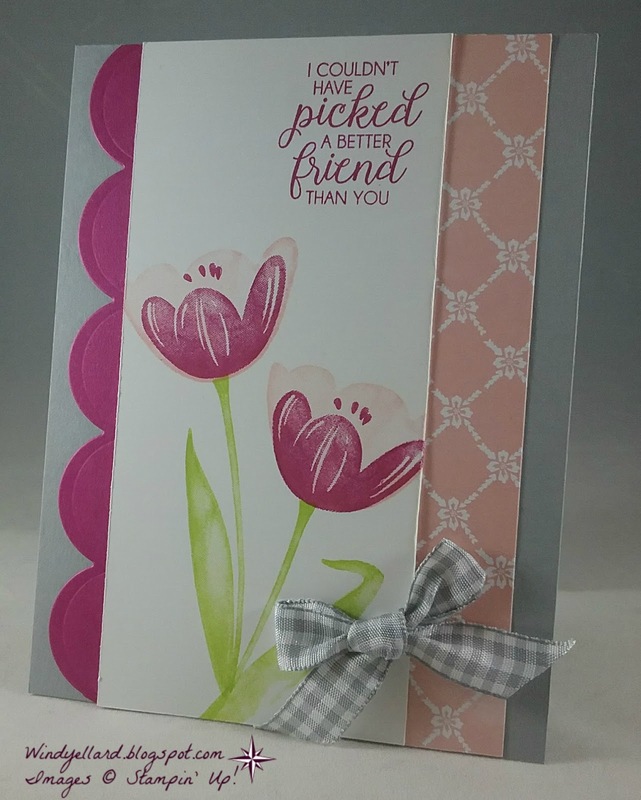 from card classes this week. I used some retired card stock and designer series paper from last fall. 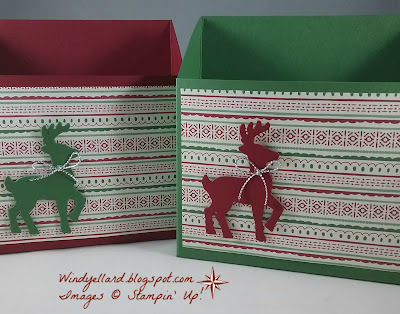 I also used some retired gold stitched ribbon. She designed these boxes to hold emboss folders or some dies. scored on long side at 5 1/4" and 7"
it is easy to assemble! for a special (male) friend. 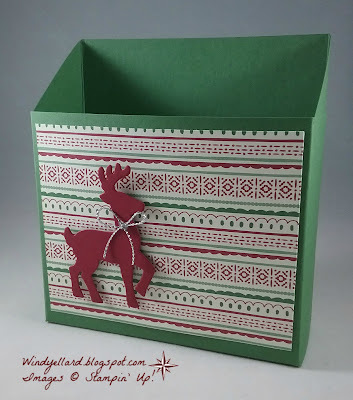 I started with the lovely Christmas Around the World DSP--love this plaid! I saw gold in it so used gold emboss powder for my Merry Patterns deer. 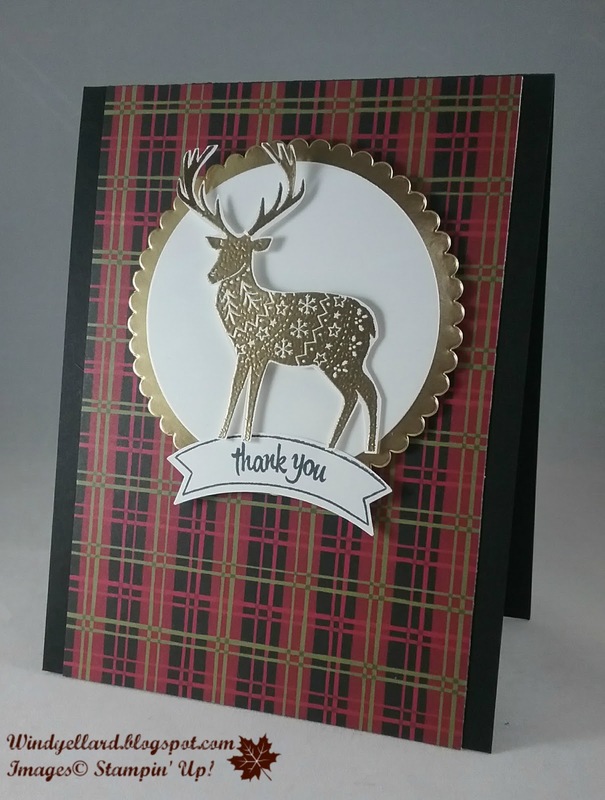 I heat embossed the deer and snipped him out. Not a great fussy cut job but works. 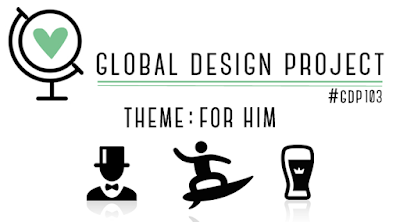 I added him onto a white circle and then a gold foil scallop circle. stamp to the punch. The punch is the Duet Banner punch. All this was layered on a Basic Black base and I love how it turned out! Thanks for stopping by and have a blessed Wednesday! 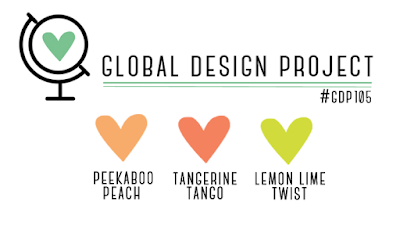 I went with the middle row across-Floral, Yellow, Punch. Floral and Yellow sunflowers (actually two yellows) and leaf punch. another piece of Very Vanilla for the base. Actually, a piece of thick Very Vanilla which is more sturdy. The sunflowers are in Daffodil Delight then Crushed Curry on top. 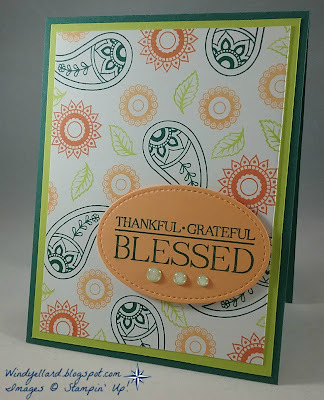 I stamped the centers with Soft Suede and the the leaves with Garden Green. 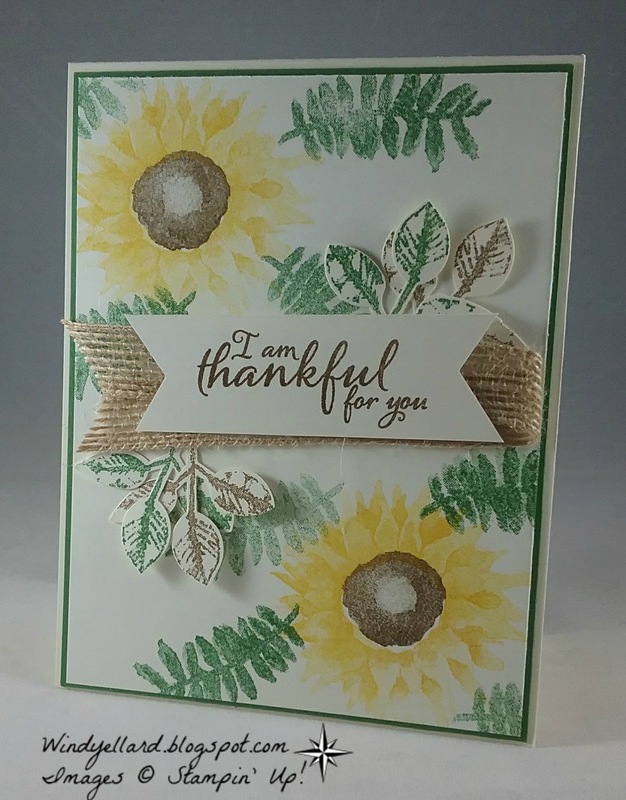 I stamped the leaves punched out in Garden Green and Soft Suede on Very Vanilla. I added them behind my sentiment and burlap ribbon. 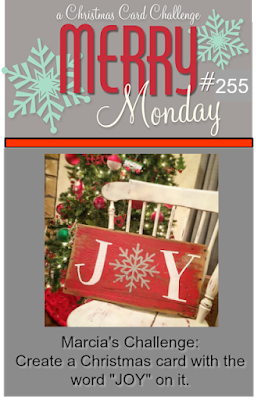 Thanks for stopping by and have a lovely Tuesday! because I collect PUMPKINS! I actually have more than I can count. I look for unusual ones esp colors and textures. I pull it all out Labor Day weekend and it is my fav season! creates a lovely decor scene. The set is called At Home With You. on Whisper White and they were cut with matching dies. Crushed Curry, Pumpkin Pie, Soft Suede Sahara Sand. The sign's sentiment is in Pumpkin Pie. I stamped the door plus door hanger in black on Soft Suede. I cut a small piece of Crush Curry togo behind the door for "lights". of Basic Black for the base. Yes, the baby wipe technique! This is my fourth card for class. 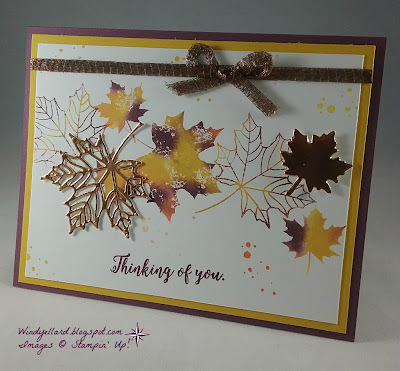 three colors of re inker on to make a stamp pad for my leaves. for my copper foil ones. I dropped Fresh Fig, Crushed Curry and Tangerine Tango and stamped several leaves. 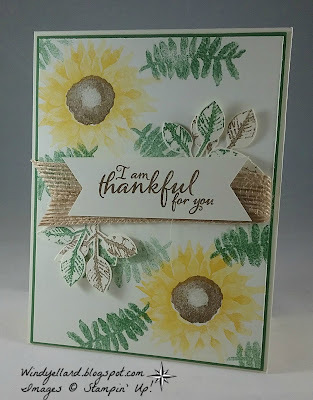 I added some paint splatter with the stamp from Timeless Textures. 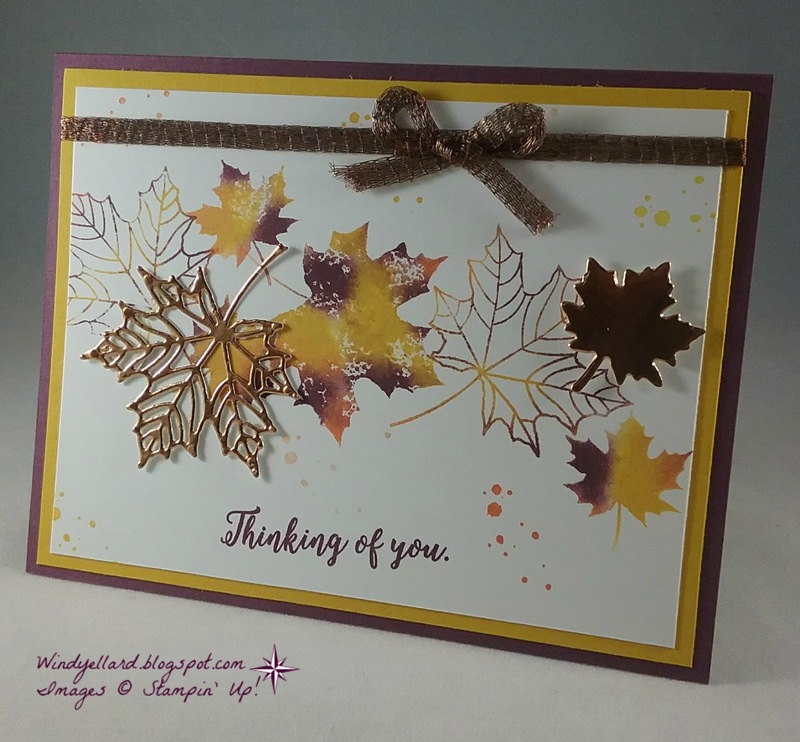 The sentiment from Colorful Seasons works great in Fresh Fig. The white background was layered on Crushed Curry and then a Fresh fig base. Happy Fall and Happy Sunday! 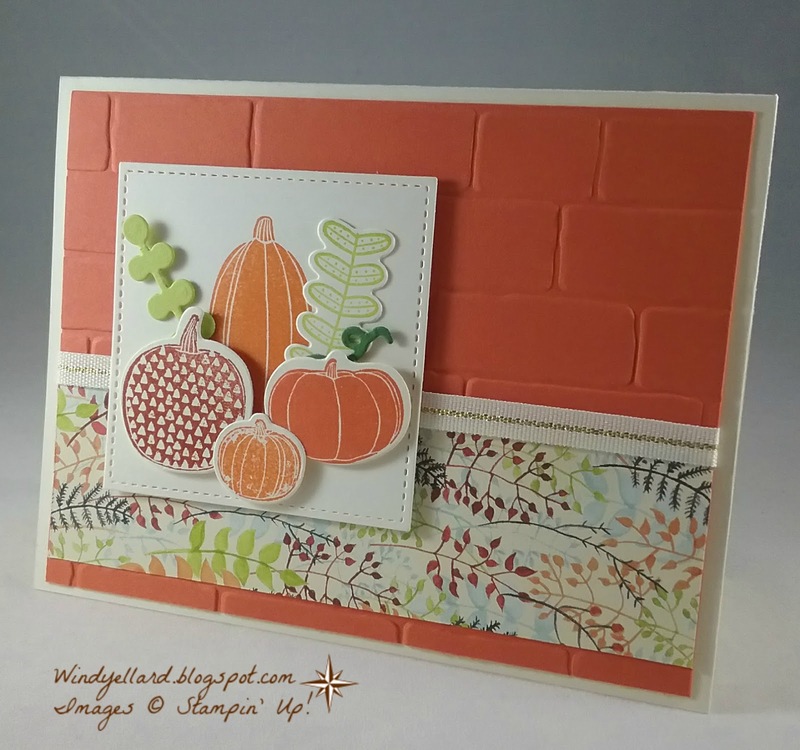 Just love this card with the pumpkins and the DSP. 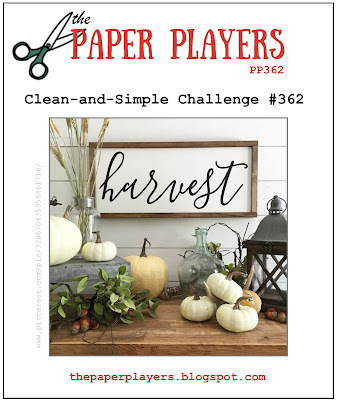 Love the Pick a Pumpkin bundle. 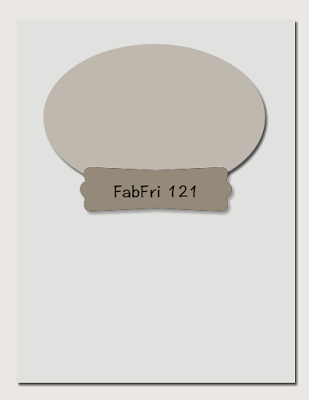 I like the Brick Wall emboss folder but several others would also look awesome. I stamped in three orange shades. Pumpkin Pie on the tall one and the littlest. 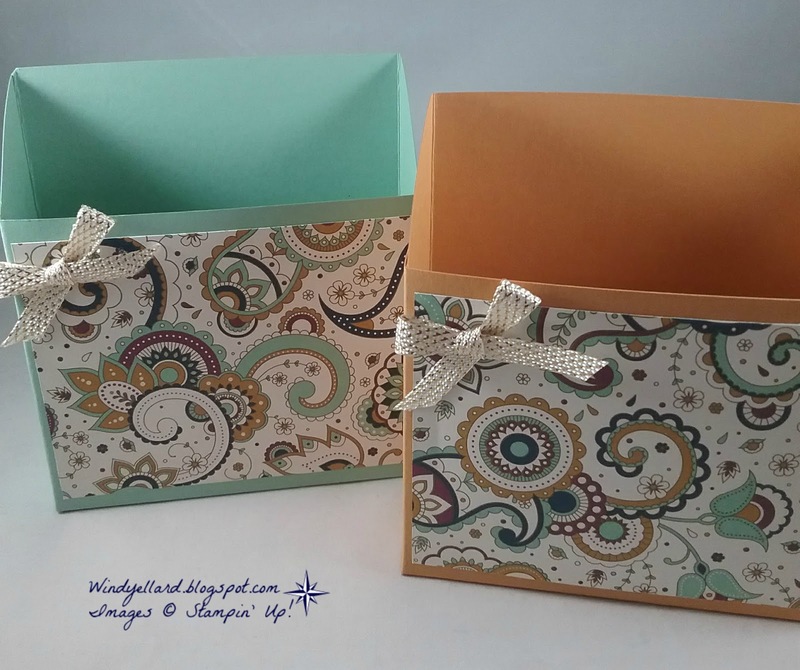 plus one cut with the same color card stock. 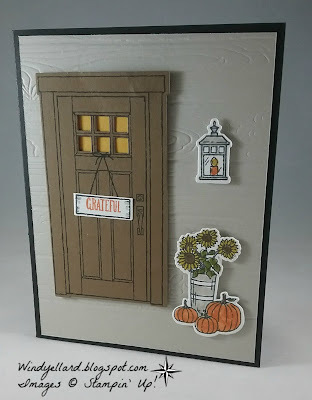 All these are cut with the matching dies called Pattern Pumpkins. I layered them on a piece of Very Vanilla Stitched Shapes Square. natural trim in gold to finish it off. 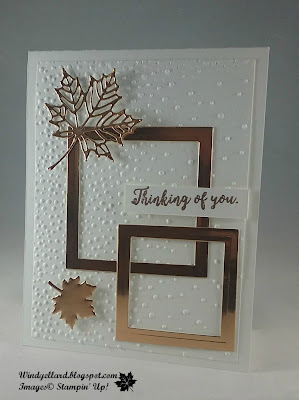 I loved the layout and the leaves behind. This is my second card for classes next week. I stamped Daffodil Delight and Curry curry with Soft Suede for the flowers. called Painted Harvest in Suede. for the detailed leaf. I used the matching leaf punch. Finished it off with some gold sequin. Might offer some of the mini gold sequin in class. Hope you enjoy your day and have a lovely weekend! 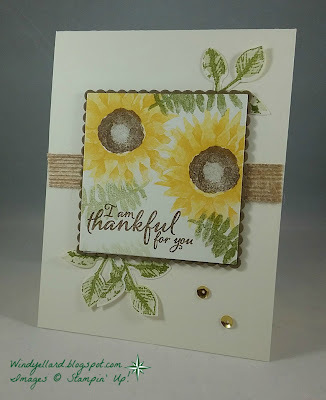 I used Crumb Cake card stock for the background. I "stamped" with my emboss folder. on top and rubbed it transferring the ink on the card stock. in Night of Navy. 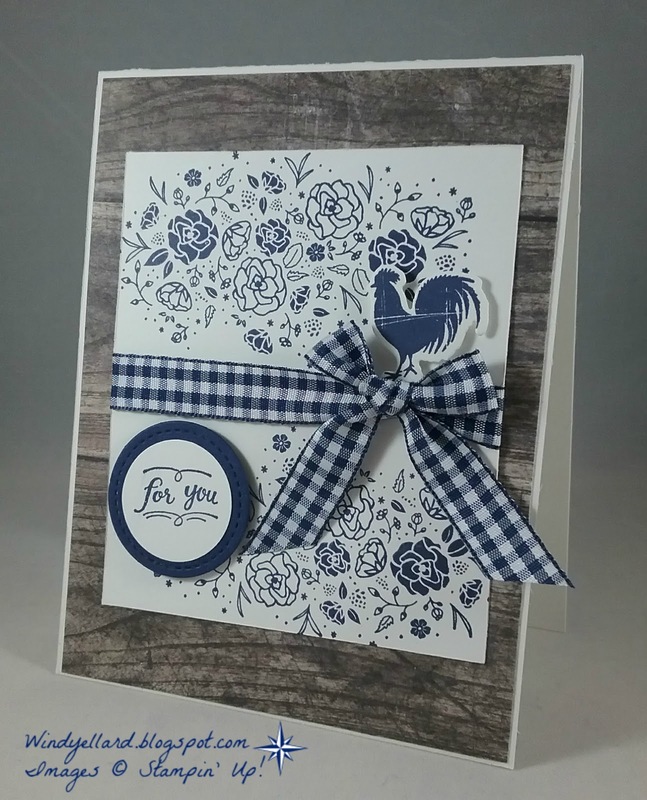 I also stamped a rooster in same color and cut with the matching dies. Finished it off with a sweet Night of Navy gingham ribbon bow. first in Powder Pink and then Berry Burst on top. scallops cut from the Seasonal Layers dies on the other side. comment the Smoky Slate base all was layered onto. and the lovely heart sentiment from the Merry Cafe set. and hand snipped since none of my many heart dies/punches matched it. I stamped the cup in Espresso on Very Vanilla and cut it with the dies. on the the cup before layering the items on it. Tango circle on the background. 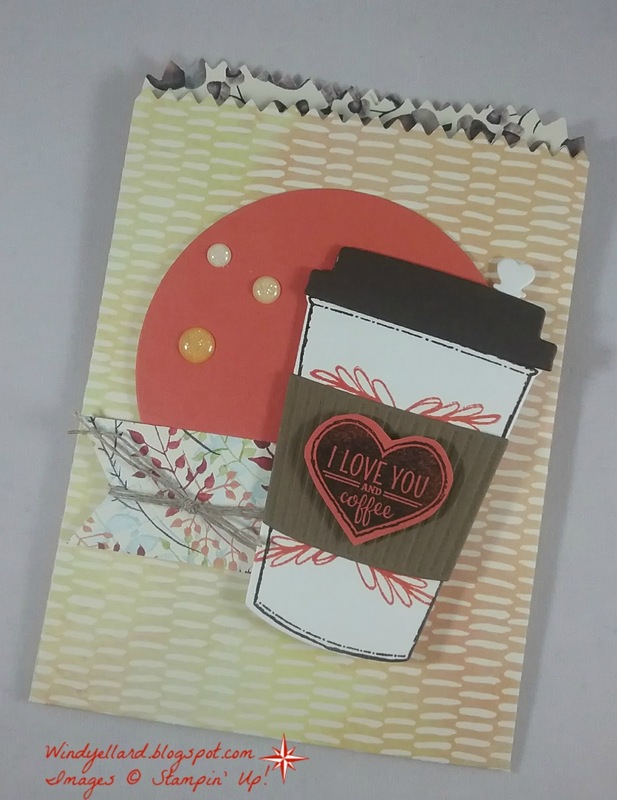 Should make a cute bag to hold a note and a coffee gift card! Thanks for stopping by and have a great Tuesday! but rescheduled due to Irma not playing nice here in Florida! 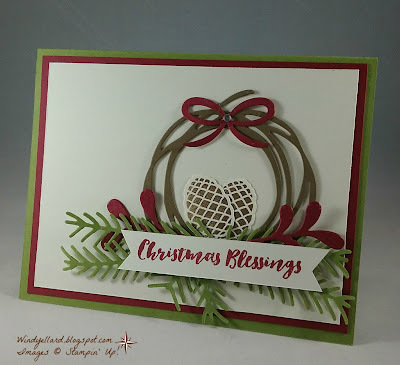 I wanted to do a wreath with this Christmas Pines set and matching dies. 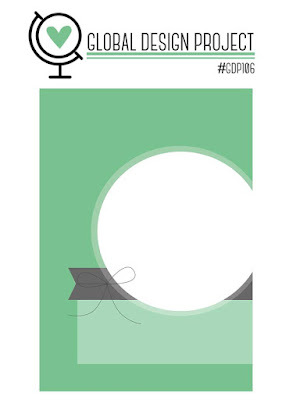 cut in Soft Suede card stock for the wreath. with dies to add. 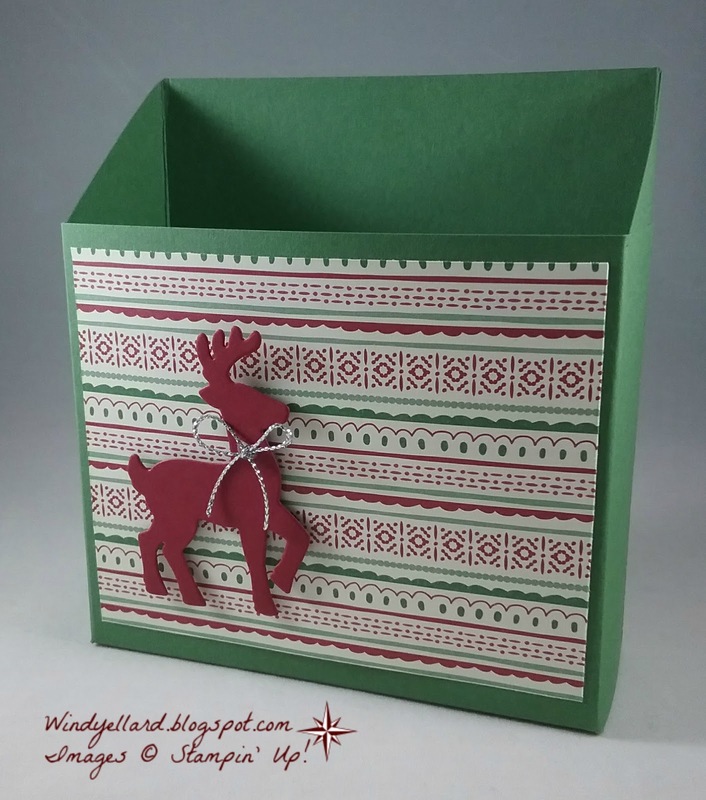 The 1/8" solid Real Red ribbon is new in the holiday catty this year. It is very thin so a little hard to make bows. underneath the background piece layered on the Old Olive base to finish off. 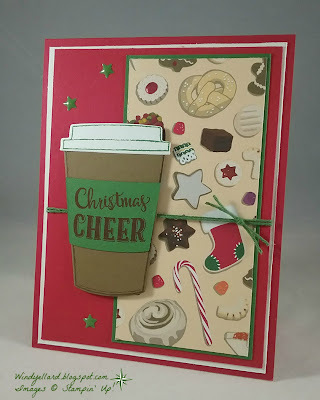 with this great bundle called Carols of Christmas and matching dies. so the bottom looks like a snow hill. Builder thinlits dies that coordinate with this set to cut the top. Dazzling Diamonds glitter to them to look like snow. and cut out and sitting right on the snowy hill! All was layered onto a Night of Navy base to finish it off. I think it will be a favorite one. 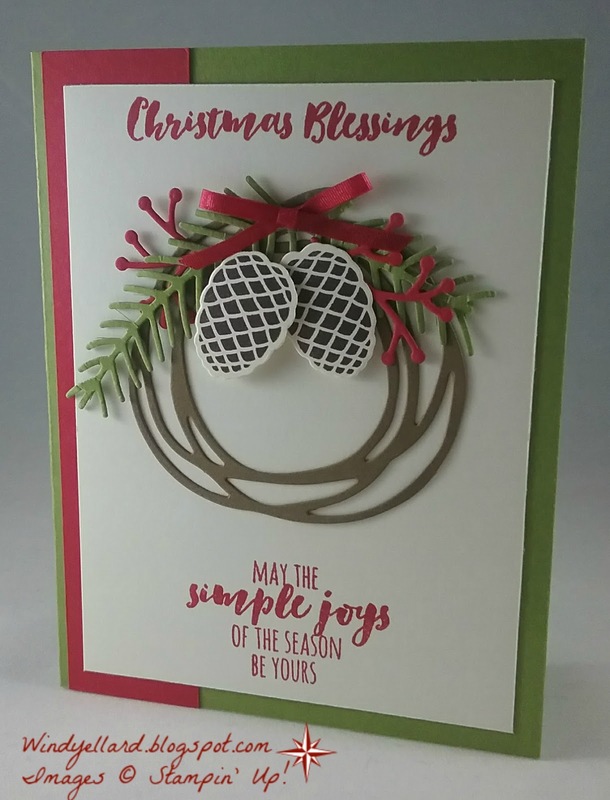 This is my third card for September Christmas card class. 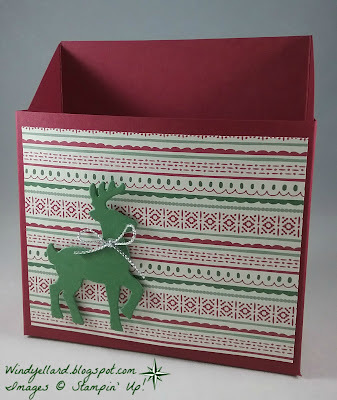 new Winter Wonder emboss folder...love the snowflake! I placed a couple pieces of a new DSP behind. 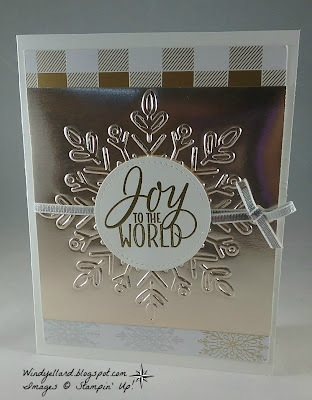 The New Year of Cheer specialty DSP is so pretty and metallic. A mix of metals- champagne, cooper, gold and silver. Tin of Tags. 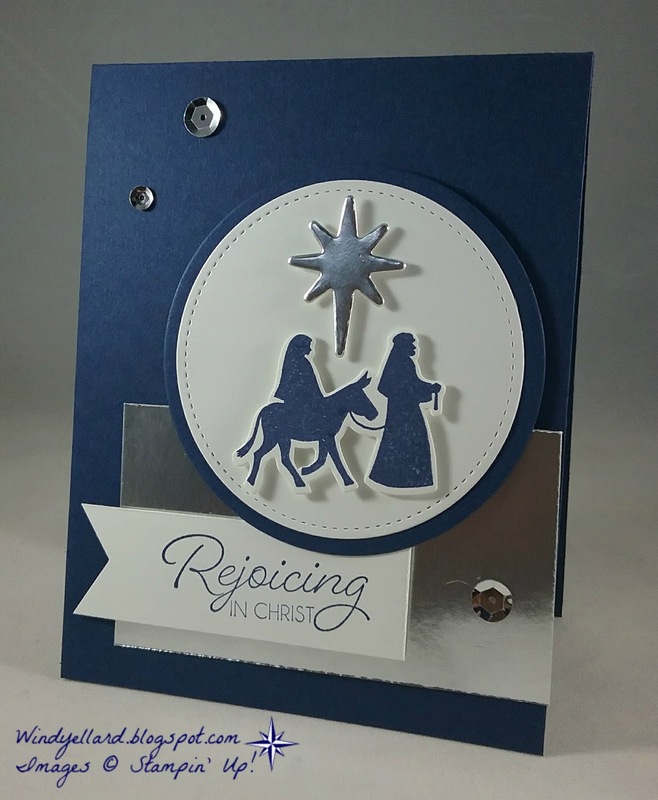 It was heat embossed with gold emboss powder. 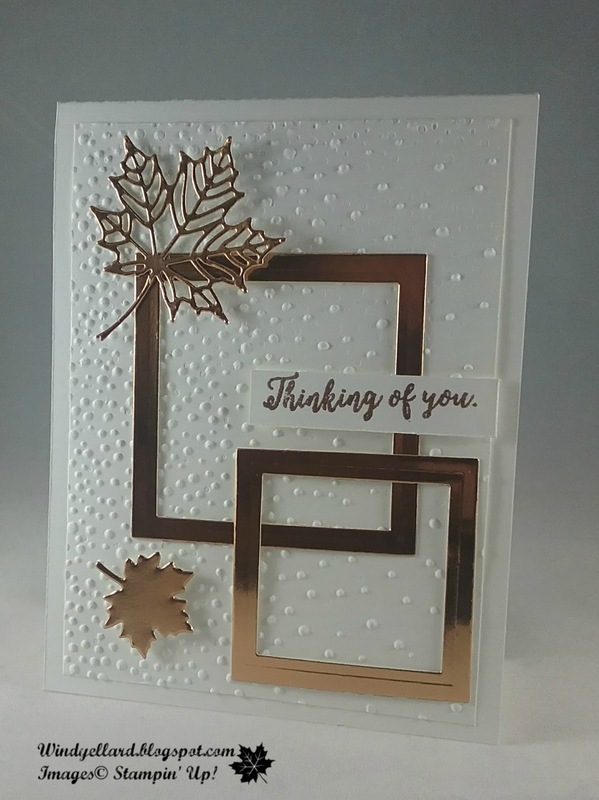 Happy with the mixed of metals which can be used anytime of year! This is my second card for September Christmas card class. donkey in Tranquil Tide to see what it looked like. 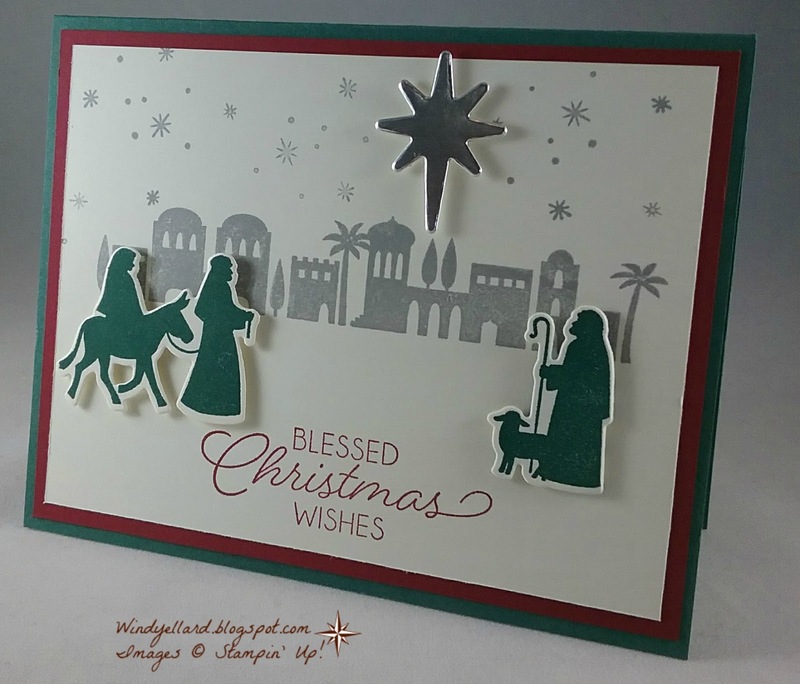 I loved it and then stamped the shepherd and cut them out with the matching dies. I also cut a silver foil star out with the dies to layer in the sky. before adding the die cuts on. I love the color combo of Cherry and Tide. 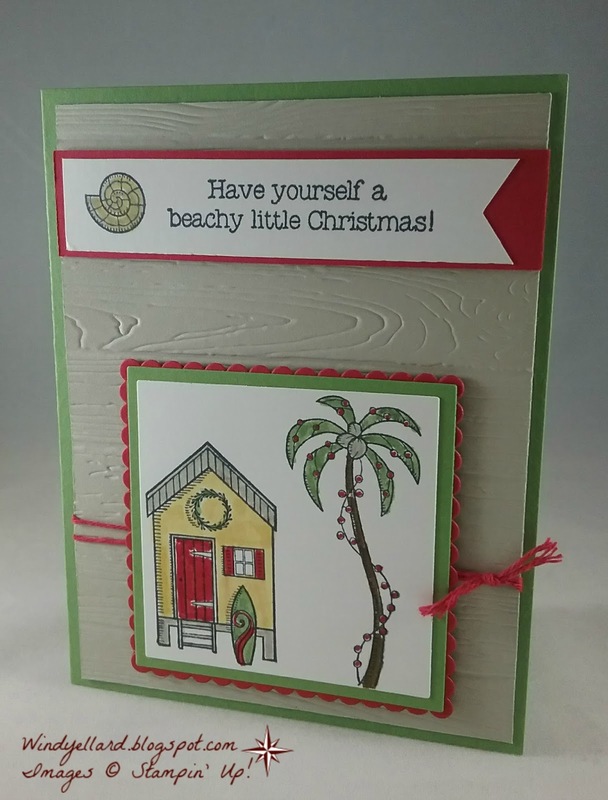 I layered the vanilla on a piece of Cherry Cobbler and then a Tranquil Tide base. Hope you have a wonderful and blessed day...thanks for stopping by! 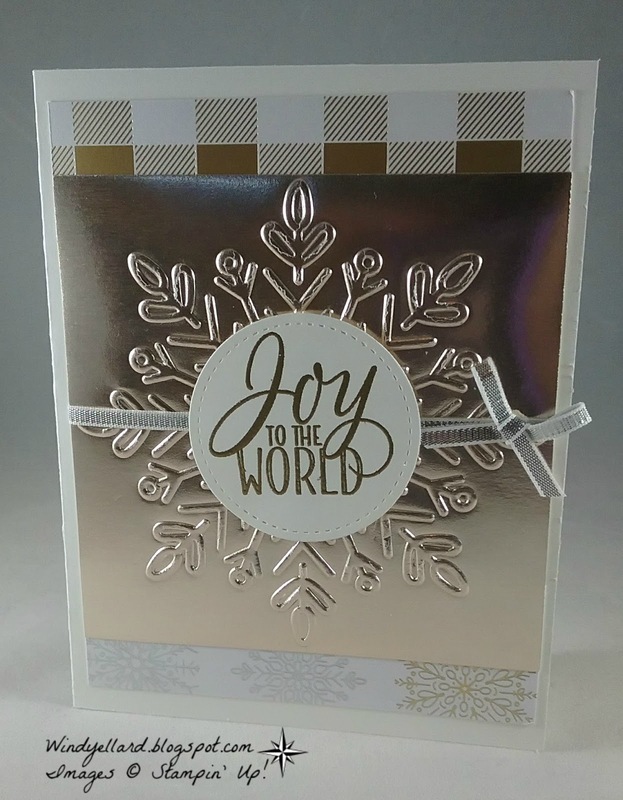 Paper: Very Vanilla, Silver foil. my Christmas classes but my class members insisted on it. So this is my first Christmas card for card class in September. I wanted to stamp that cute palm tree with lights. I added the beach house and colored them with markers. and a shell I colored in on a white banner then layered on Real Red. and layered them on a piece of Wood Textures DSP. I layered the DSP on Very Vanilla and a Fresh Fig base. it does not show up well in the photo. Must play with the leaves some more later. 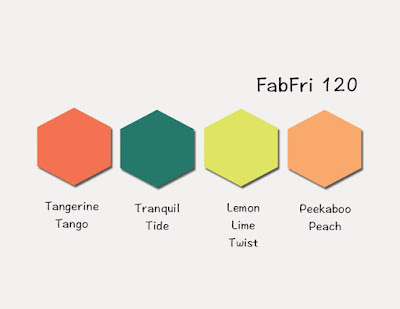 I stared for a long time with this color challenge. but I saw others use it so decided to look for something else. and a Tranquil Tide base. I finished it off with some glitter enamel dots in three sizes. I have been hoarding this ribbon!!! 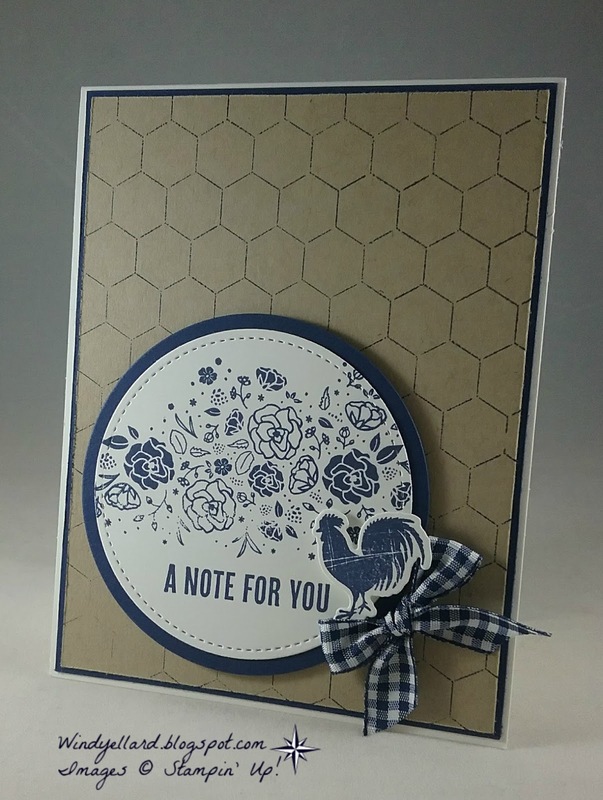 Yes, the 1/2" Night of Navy gingham ribbon!!! I have wanted to use it but keep thinking I am saving for something! Well, I decided to force myself to use it today! piece of card stock and the ran the ribbon and made a sweet bow. 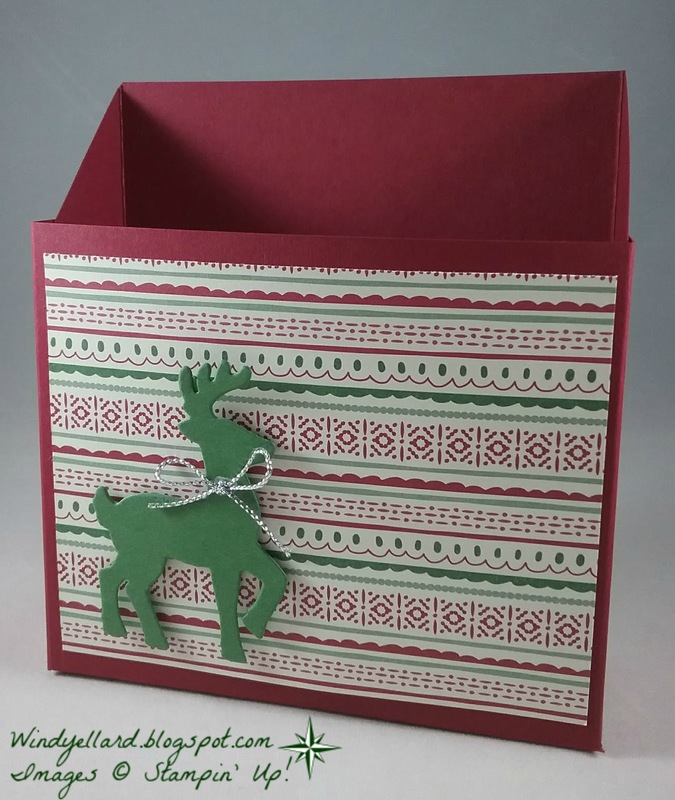 and used the matching die called Wood Crate for him. base but then thought how cool would look with Wood Textures DSP. I have been hoarding it too! I think my mom will like this card! I hope you have a fab day and thanks for stopping by! I made this card at the same time I did the one last Monday. 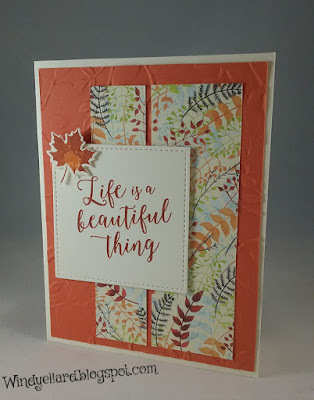 I was experimenting with the embossing paste and mixing colors. diamond mask from the Pattern Party decorative masks. I added some Coffee Break DSP to the side. Always Artichoke. The lid is Early Espresso and the sentiment is in Soft Sky. It showed real light here in the photo. 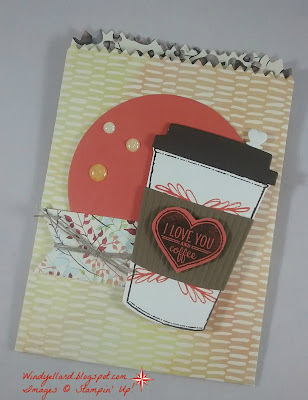 I cut all these along with the paper sleeve with the Coffee Cups framelits dies. 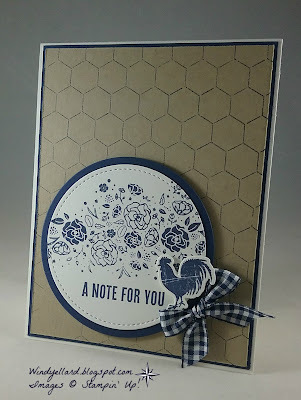 Fun cad especially with the embossing paste and diamond mask!